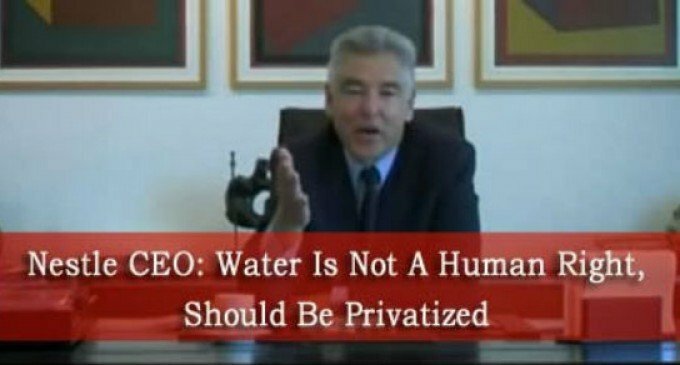 "Why is it that people have to pay water bills in a world that is two thirds water" Martin Luther King Jr.
That is because humans have no right to water according to the Nestle CEO. They have no right to it because water should be commodity and humans should have pay for something that nature gives for free and is essential to life. So if you don't have money to buy water, you will just die of thirst which ten of thousands of people do every single day. But do these companies care? No. Companies like Nestle are buying up the world's water supply in effort to make profits of the world's fresh water scarcity while simultaneously polluting the world's fresh water so they can sell bottled water in the first place. When companies get their hands on the world's water, millions will die of thirst, wars will be fought over water, and fresh water will continue to be more scarce and polluted. The coming global water crisis and privatization of the water by banks and huge corporations is just another example of how kapitalism kills!